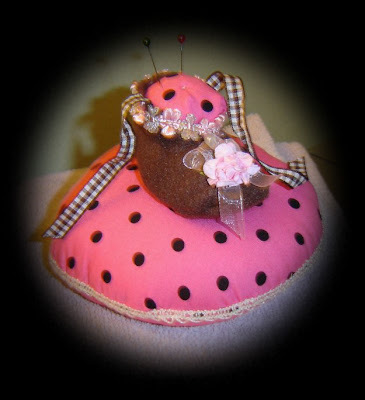 the tiny rose bud is also hand sewnon..You know since this pinkeep is for a pinkeep swap I thought and thought and thought some more, what to create for my extremely talented partner.. once I started it was like I was on roll and just didn't want to stop! What fun! have you ever freaked and asked your self why do I sign up for swaps??? Gosh golly..it is like right away you step back and look at your creations and then think about who ever your partner is,Right away you think "Oh gosh nothing I create is good enough"!! But I stopped and sat back and really thought about what a swap is..It is to be FUN! I am ,sending to her and she is sending to me both of us has a bit of us in it.. see its our hearts we sew with! Once I started it was like I was on a roll and just didn't want to stop!What Fun! As with all swaps..My partner is extremely talented,and Whimsy is her gift. So I'm a bit nervous ..Always asking myself why do I do swaps..Well there such fun and when your creating just for fun it really comes from your heart! This has got to be the best eye tutorial I have ever seen! Thank You Rivkah!! for sharing this awesome knowledge with us all! 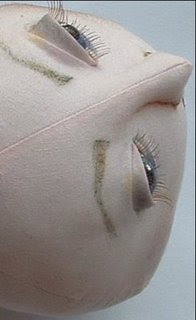 Please be sure to go to Rivkah's blog to read this wonderful tutorial about how to create the best dimensional eyes for our cloth dolls! 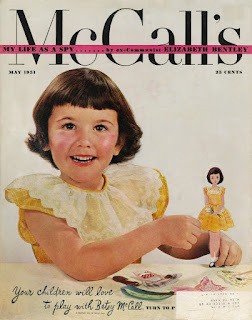 Looking Good- Making Fabulous Eyes for Cloth Dolls Rivkah has had multiple requests for this article, which appeared in Soft Dolls and Animals Magazine some time ago. 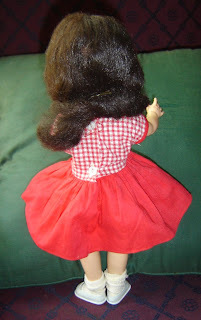 This is her "signature technique"- I learned how to do it by trial and error and it's my favorite cloth doll face - making method. Here it is- unabridged, unedited and un-resistable! [Japan Craft Journal] was created out of a desire to have a central source for all things relating to Japanese craft. It will also have details on where to find crafts and craft resources in Japan - for those of us lucky enough to travel there. We will also be featuring links to blogs and sites that offer great information too. 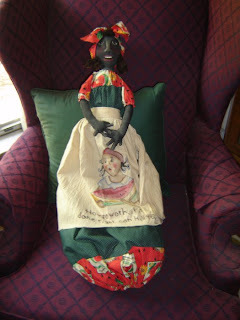 I went to visit Tonya of BackPorchPickins today and look what I found....I am going to copy and paste what Tonya wrote on her blog. We will get you added on and send out some information on the auction as well. The auction will take place September 7th-14th.We are still currently working on the website, and it is almost done! We have a few more personal stories to add on from our family. My family thanks you so much for all of your continued prayers and love. 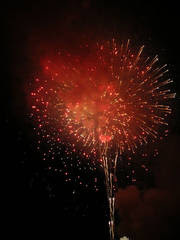 The outpour of love you have so graciously shown has really been so wonderful during this time. They are just astounded that people, some of whom we don't know, will come together and do such a loving and caring gesture for a blessed little girl. Crafters and artist from all over have graciously donated their time and items in memory of Mallory for a silent auction. We will be coming together September 7th through September 14th to raise awareness for Trisomy 18 which Mallory was born with. Here is a badge/button for you to use.. I had some email me saying their unable to read my posts saying the font size was way to small..
top tool bar..click on view..click on ..text size..
On a personal note:I'd like to share with you all my friend Kathy Lees..She is a wonderful most up beat and inspiring person I have ever known, She is a gal who loves her husband and her family, and loves she loves her friends and treats them as they were just part of her family. I truly have been blessed to have Kat in my life , and in my familys life too.,She has so patiently took me under her wing and guided me when I would have just thrown in the towel. We have shared many things of our lives in our life's journeys , Tears and many giggles right into roaring laughter! Kat and I also have shared many things in the wonderful world of Art.. Our Hopes and Our Dreams.. Our disappointments and Also Our wonderful WhOHoOo's moments too! Though Kat and I create in different passions we truly compliment each other because it is the passion and cloth,and the thread and the love for each and for what we create that binds us together. Now I'd like to share with you the talent and the passion of this artist with you all. Kat is so very talented in many media's. 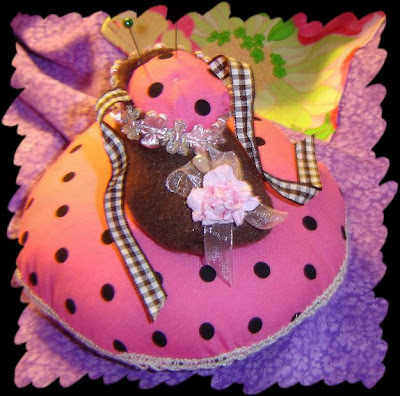 Many years Kat has been designing Dolls, Patterns, Painting Techniques, Clay over Cloth, E-Patterns, Classes, DVD's, Kat also teaches classes and is a very popular Teacher. 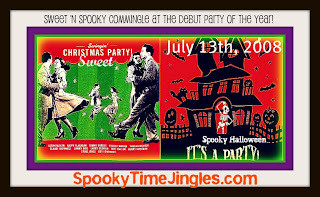 Kat has been designing a awesome and very whimsical Holiday design for a year now.. 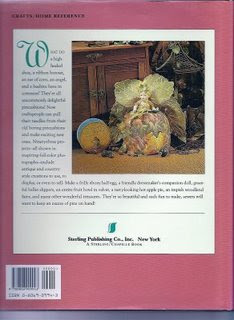 It is her Series of Elves ... Let me introduce this awesome and magical wonder land magic to you. 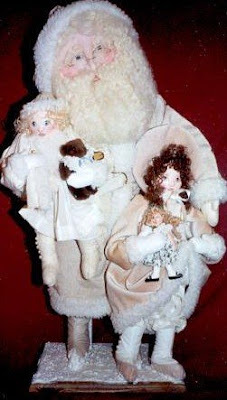 Candy is a charming little helper for Santa. stockings with CANDY CANES of course. chalks, pens and then sealed. 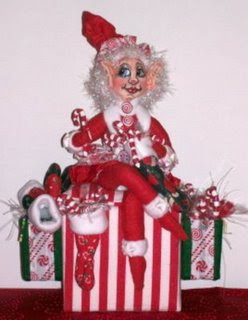 #2: ~ SHERRIE THE POINSETTIA ELF...Sherrie is a stump doll, which means she has no legs. 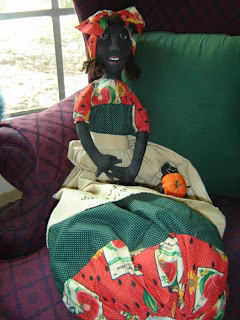 This doll is made of cloth and felt. 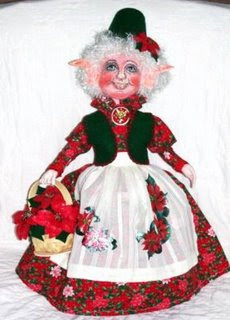 She is carrying a lovely basket of poinsettias for Mrs. Claus.The poinsettias you make out of FELT and wire.Her face is done in softer tones in chalks, a bit of paint and pens. 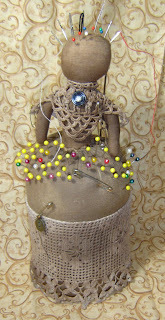 She has that twinkle in her eyes.Sherrie stands about 18" tall on a wooden base. 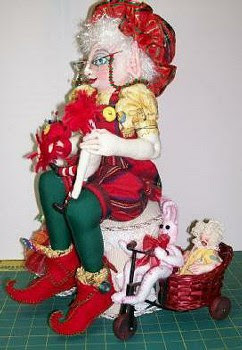 Here is Kathy Lees ( Designs By Kat ) next ELF in Her Series of Elves, She has been creating since last year. 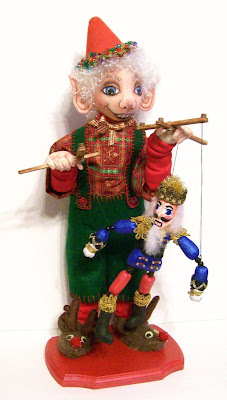 Dooley is a loveable Toy Maker and just loves making marionettes for all the children to play with. 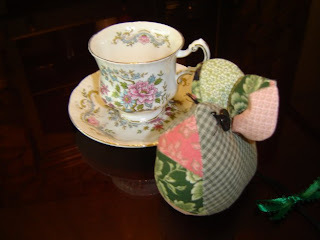 To find out more about DOOLEY go to: http://KatsHolidayShoppe.blogspot.com/ She is currently writting this pattern. The E-PATTERN and the CD WILL BE AVAILABLE SHORTLY. Stay Tuned!! Join our Farmgirl Chatroom: Chat with other farmgirls from around the world! Anyone can read our discussion topics, but to join in, you need to register. To the right, you'll see the four most recent posts from our 4,000 members. Start or Join a Farmgirl Chapter:If you're yearnin' to meet up face-to-face with other farmgirls in your area, start or join a Farmgirl Chapter. MaryJane is proud to say that there are now 462 Farmgirl Chapters located in 46 states and 7 countries (US, UK, Brazil (our newest! ), Canada, South Korea, Australia, and New Zealand)!! These groups consist of diversified, talented, caring, creative, like-minded women just like YOU! This is truly the best sisterhood to be found anywhere! 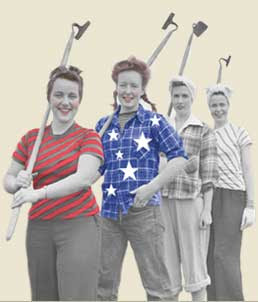 Sign up for Farmgirl Projects: Calling all farmgirls! 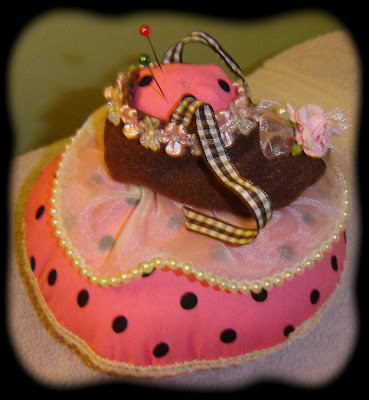 Take a peek at the variety of projects created by our fabulous farmgirls at heart. We're sharing traveling dolls, aprons, and books, creating Mail Art, making Charm Quilt squares ... who knows what we'll think of next? And ... you’re welcome to join in! 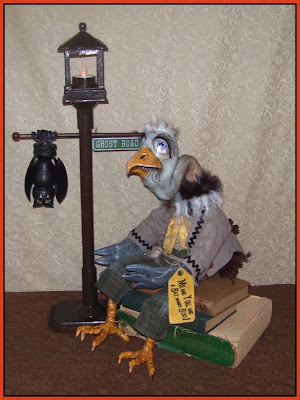 Good Morning every one..I was taking a pleasant walk looking at WSOAPP Halloween Parade on ebay...I was thinking already there are so many witches..I've been thinking of what I could create for the up coming Fall/Halloween Season that was different..then I came across Cre8orsTouch ebay offerings..Oh this Vulture doll just popped out at me big time, I know I could never create any thing with such awesome detail as this doll, It made me smile and just fall in-love with his sweet face..and ya know you could keep him out year round with his expression celebrate all season's and holidays..
it is wonderful and just full of great news,tibits,gold nuggets. 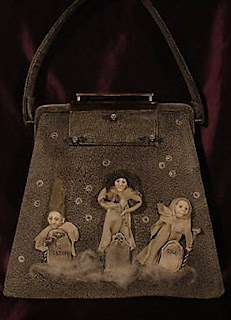 and saw this amazing purse!.It is a must to see..
be sure to lokk at all her pictures..It is really fabulous! I bit spooky for me,but it is the artistic value that caught my eye! 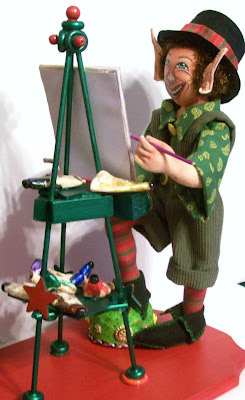 Enjoy all the fine artists offings ,Hope you will find some thing you will cherish!! Pat Rockway of Just Between Us Girls left a comment on my blog.I went and visited her "Awesome Blogs"
identified this as a camping stove item...to make toast with. GOOD FOR YOU SHERRIE...CONGRATULATIONS. But what is more exciting is the products Pat offers ..I am just blown away..I want every thing!!! 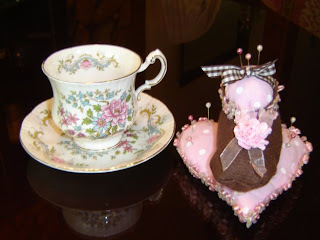 Her New Blog Shoppe, "It's a Wonderful Life!" Let Be "Fall" Halloween ! 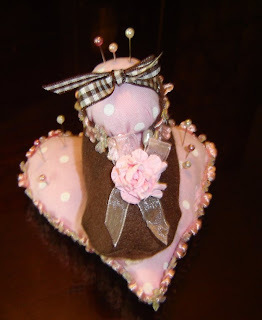 Iam running off to start on this cuteie.. Please go over to visit and support these amazing artists who have worked their tails off to get ready for this debut. Also, enter to win fantastic door prizes! Plus FREE shipping site wide for the update month of July!!! Come On take a peek for even more surprises! An introduction to reborning and newborning techniques. 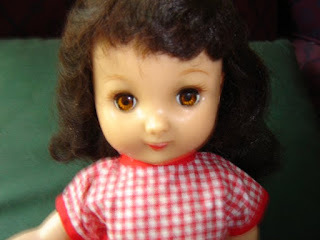 Ideal's 14" Betsy McCall not knowing what I have! 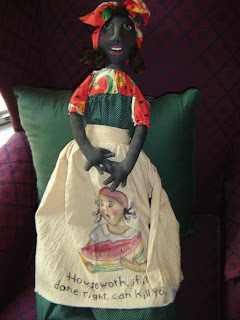 I have been down sizing my dolls getting every thing ready for when we sell our house..I bought my Besty McCall off eBay about 5 yrs ago..I have had her packed away for about 2 yrs.. 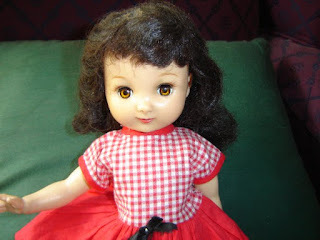 I Unpacked my dolls and have been sorting them out to sell..
Before I listed my Besty I thought I'd do a little research on her.. This is a good lesson at least for me to always check out research before you sell any thing..I've always gone by my heart.. 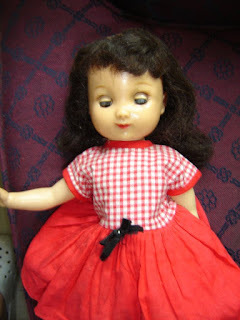 Doesn't matter because i have fallen in love her again now that she is out where i can see her.I have a vintage 1950 clothes pattern for her.I'd like to order some real 1950 vintage fabric and sew for her.She is my buddie just like when I was a kid..
More history:Shortly after the initial paperdoll version in 1952, the Ideal toy company, recognizing a good thing when they saw it, introduced a 14" Betsy McCall doll; She was unique in her time, as her hair was made of a new "wonder fiber" Saran, that unlike the hair of other dolls, could be combed and styled. 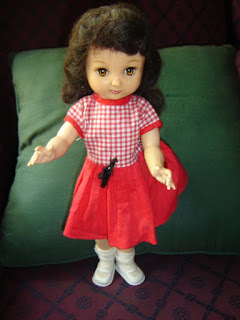 In the mid 1950's a company called American Character started producing an 8" version of Betsy, and all of the sizes of the new Betsy dolls had everything a girl could ever want: large wardrobes, outfits with accessories, china silverware,doll houses and furniture just to name a little. 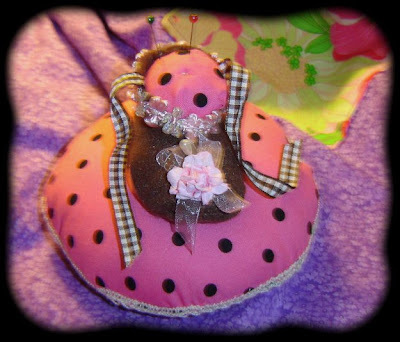 Felt so good to be in my sewing room.I got a couple new pin keeps finshed !! 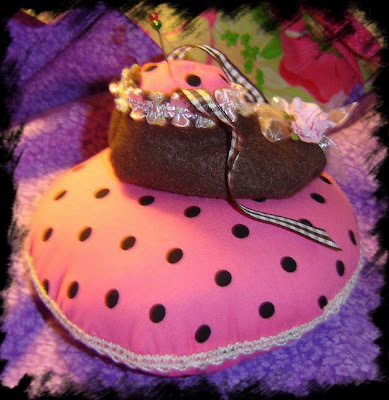 I'm in two pin keep swaps..So i'm tring out some ideas I have in my head..Have a couple more ideas I want to try first , before I make the real pin keeps for the two swaps..So far..I'm happy with my slipper on a heart keep. 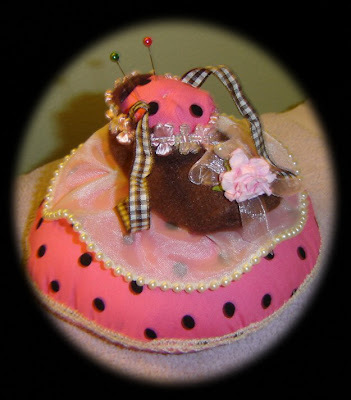 Just the right size to have by when your watching tv and hand sewing.Abit of whimsy!! The little mouse is defiantly not my style,So it's back to the drawing board for him.Though he would really be cute sewn in batiks ,bright color wash also! here is where we will be tonight to hang, relax, drink, and eat, watch fireworks over Tampabay!! 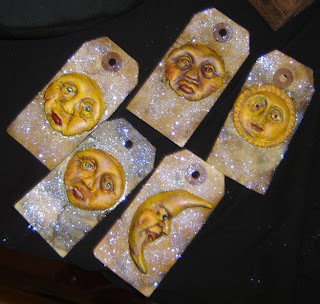 Thinking open windows with crisp air flowing through out..
What better time to start creative creations like these Fall Folk Art Tags.. I'm totally into my fall line..awww tis a good thing to be thinking!!! Orange, Red ,Yellows, Golden Browns, Rusts, Purples, Greens, Black, Jack-O-Lanterns, Cats, Mice, Trick-or-Treaters , Whimsy Witches all a glow , Dolls dressed for the fall , Dolls Dressed for the Halloween season , Tags awatiting for cards and packages, Pumpkins of all sizes and all faces , ScareCrows Man and Woman, Thinking Feather Trees adorned with Fall Ornies, for Halloween , For Thanksgiving with oodles of lights to shine upon them.. Thinking Cool!! Vintage Halloween Tags , Arrangements of Mums, SunFlowers , All kinds of Fall Flowers, Hay Bales, Acorns , Dried leaves, and thinking cool:) !! 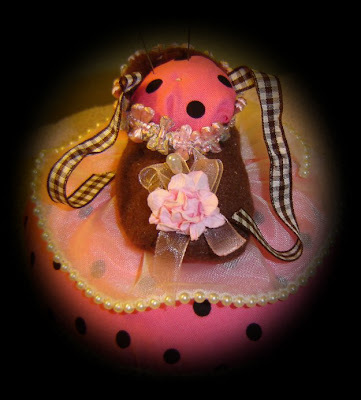 Once again I'm looking forward to seeing all the creativety that comes from blogland friends! 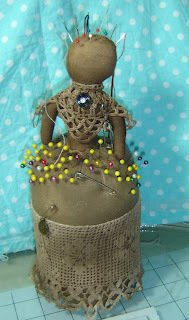 My Primitive pin Keep!..This is a keeper..I'm so happy how she turned out!! click on picture to enlarge if ya wanna:) As you see I really do use my pin keeps! 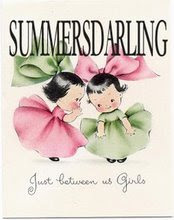 I'm 100% Vintage kinda gal.This book really has it! 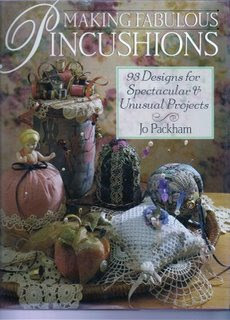 Many color photos and pincushion designs in this book is great to even just snuggle up with your favorite cup of and enjoy the 93 Designs !.. I do not like real rusty any thing just a bit of what I call tarnish rust..
Nice vinatge age to it.. Combine the ingredients in an Quart Jar..
Now place in a safe spot and let set for 2-3 days. Step 2: I dig a hole yep where I know NO one or animal can dig into to . Then I wash clean with gloves and the hose of water..
every thing and rinse really good..
Then spread them out on a old cookie sheet let dry in the sun turning to be sure they dry nice. 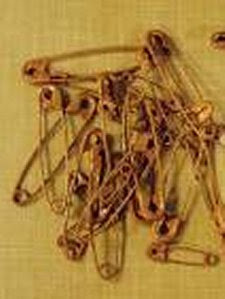 I also like to use a old piece of towel or some thing soft and kinda buff the bell or pin to remove any loose rusting kinda gives a smooth buff feel..and then use them tada!